The application of Global Navigation Satellite Systems (GNSS) in the earth sciences has become commonplace. GNSS data can produce high-accuracy, high-resolution measurements in common reference frames. Static GNSS methods take advantage of long occupation times to resolve fine measurement and time-series data to capture events such as tectonic deformation, earthquakes, groundwater depletion, and slow-moving landforms. This unit focuses on design and field execution of simple static surveys, emphasizing the benefits and limitations of the technique. Students will learn which applications the technique is most applicable for as well as the standard data-processing techniques. Additionally, students advance their understanding of GNSS systems through interpretation of field data from static surveys and public data sets of continuous-operation stations. This unit prepares students to design and implement a survey of their own through hands-on instruction and demonstration of rapid-static or static techniques in a field setting. 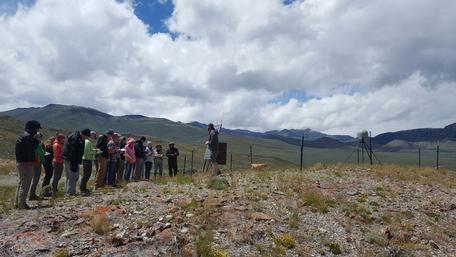 Idaho State University students visit a Plate Boundary Observatory station in Central Idaho. Students are able to design, conduct, and process results for a simple survey. Students are able to analyze and interpret static GNSS station positions. Students can apply findings from static GNSS observations to an issue important to society. Cognitive: Teach students to make decisions on balancing numerous competing factors in designing the optimal static GNSS survey for a given location or problem. Behavioral: Promote students' ability to assemble and operate a static GNSS antenna, receiver, and related equipment and make supporting field observations. Affective: Share with students the value of the high-accuracy positioning possible with static systems, giving examples such as measuring earthquakes, volcanic inflation, groundwater depletion, landslide dynamics, or tectonic deformation. This unit is appropriate for upper division geoscience, earth science, geography or civil/environmental engineering students who have already been introduced to basic concepts such as plate tectonics, mass movements, and hydrology. Students should also have a first-order familiarity with uncertainty, precision, and accuracy and the science behind GNSS systems (Unit 1: GPS/GNSS Fundamentals). It is not necessary to have completed any parts of Unit 2: Kinematic GPS/GNSS Methods in order to teach Unit 3. The unit is appropriate for academic year courses with field components or a summer field camp. This unit builds upon Unit 1's fundamentals (such as GNSS systems, precision, accuracy and uncertainty) and assumes that users have either completed Unit 1 or had previous training in GNSS concepts and terminology. This unit is designed for a mixed classroom/field setting. However, we encourage that the initial lecture be followed by a field experience with hands-on demonstration of static GNSS equipment or a visit to a PBO or other permanent static GPS site. Students should use printed handouts for note taking, either directly or as a guide for personal field books. The final portion of the unit requires computer access with GNSS processing software appropriate to the brand of hardware used. An internet connection is not mandatory, but it will require additional preparatory work if a connection is not available. This unit requires that either pre-processed data is available for students (from a previous year or occupation, for example) or that additional time is accounted for processing positional data. OPUS is currently the best possible solution for a rapid processing, although it is not the best in terms of absolute accuracy (a few centimeters at best). Using OPUS typically requires a 24-hour period between acquiring data and submitting it for processing. This means the course can be ideal for interleaving other activities or academic semester courses where this time is not an issue. In a field camp setting, it may be easiest to have prepared or pre-processed results or the ability to return to the GNSS project after a few days. This unit begins with an introduction to static survey systems through a lecture and introduction to the Static GPS/GNSS Survey Methods Manual. The lecture is presented with a PowerPoint that illustrates static surveys, their applications and advantages, a brief processing overview, and a review of interpreting position results. During or after the lecture, students should be presented with the Static GPS/GNSS Survey Methods Manual. This manual introduces students to the various types of static surveys, equipment, and methods for a successful survey. The methods include survey design, execution, and processing. It is not critical to read the manual in its entirety but for students to understand the basic components of a system and the general steps for a successful survey. The lecture and manual introduction should take at most one hour. Following the lecture and the introduction to the manual, a short field component should introduce students to the static GNSS hardware either through a hands-on demonstration of setting up a unit over a benchmark or a visit to a permanent, continuous station like a PBO site. The field component should also require ~1 hour. After being introduced to the manual, students should be given the 'Introduction to Time Series' assignment. This assignment will correlate with the last part of the lecture and ask students to interpret static GNSS data from continuously operating and campaign sites. Though there are already sites selected for the assignment, you can modify this to address a different field area. The assignment solidifies the concept of position velocities, vectors, and interpretation of events in a time series. Students will need a small ruler, pencil, and possibly a calculator for the assignment. The assignment should take students 1 to 1.5 hours. Students should be provided with the necessary equipment and take part in an example static survey including setting up equipment, collecting metadata, surveying the location, processing data, and reading results. Students should be guided through the Static GPS/GNSS Survey Methods Manual as the instructor demonstrates proper set up and data collection. Students should then get hands-on experience with the equipment and survey a location. They will survey one or more locations and fill out thorough field notes about both the field site (example field notebook (Acrobat (PDF) 1.4MB Dec2 16)) and the monument (monument visit logsheet). It is advantageous here to have several pieces of equipment so that no more than 4 or 5 students are working at a single receiver. Students can rotate jobs between writing notes, taking measurements, and operating the receiver. Typically, a rapid-static survey (occupation of at least 15 minutes to 2 hours) will be ideal, unless this activity can be alternated or interleaved with another activity. When the survey is complete, students should then be shown how to retrieve RINEX data files from the receivers and process them through an appropriate program. For those using OPUS there are instructions in both the Static GPS/GNSS Survey Methods Manual and the stand-alone Static GPS/GNSS Data Processing with OPUS Manual. If there is access to an internet connection, students can process through OPUS directly; if not, pre-processed results are needed. The survey, processing and interpretation should take ~3 hours, not including the OPUS wait time. Note: OPUS requires approximately 24 hours before positional corrections are available for a given time period. That means you will need to account for this time delay with another activity. If you are teaching Kinematic GNSS as well, a static survey can be set up first and allowed to run while the other unit is taught. Once data is submitted to OPUS for processing, results are typically returned within 1 or 2 hours. Be prepared with an alternative data set if OPUS fails to return a corrected position. Student exercise: students gain familiarity with time-series of GNSS positions, learn to interpret signals and noise, and apply this interpretation to a scientific question. Student exercise: students complete an introductory static survey. Students get hands-on time with equipment to become familiar with its use before applying skills in the summative assessment. Summative assignment: students design and conduct a GNSS survey that adds new data to a previous static occupation. Students then interpret their results in light of historical data. 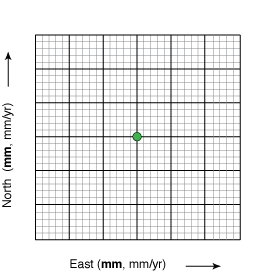 An initial guide for GNSS surveys. This covers the merits of various campaign types, data collection and processing, physical equipment setups, and monument logs. This can be given to students in the introduction so that they understand the depth of the material, take notes as necessary, and reference it when necessary.This was used as the basis for the "Static GPS/GNSS Survey Methods Manual" but contains additional information as well. It is critically important to accurately fill out a monument logsheet in order to have the information needed during processing. The time-series exercise is best employed if it uses examples from local areas or sites that are significant for the survey students will complete later. For example, the original assignment is written for three stations distributed across the Borah Peak Fault, the feature that students would then survey a leveling line across. This allowed students to gain a tectonic motion perspective for the leveling line data they were acquiring and familiarized them with the relative merits of the two different approaches to a GNSS survey. Plate Boundary Observatory Network Health Map. Zoom into your area of interest. Click on a individual station and then the station name to get to the station info and data page. DAI 2, the data archive and visualizer for campaign and PBO data stored by UNAVCO. Use the map to locate PBO or other permanent installations related to your study area. You can download the time-series graphs directly to replace the ones in the assignment. CSV point data is also available for download through the interactive data tool. Then review and modify questions in the assignment so that they are appropriate for the new data. Much of the formative assessment can be done through observations of and discussions with students individually, in pairs, or sometimes in the whole group. This should be done periodically throughout the process as it helps gauge student understanding and weaknesses. Students should be encouraged to answer their own questions through deductive reasoning. A large portion of the grading should be attributed to students' individual participation and contribution to the group effort. Students will turn in their student exercise. Questions should be graded for completeness. The Summative Assessment is the Static Survey of a Leveling Line. Students measure a leveling line (or other campaign deployment scenario). Students should be assessed mostly on their ability to perform the survey and to place the survey's results in a broader context or social implication. GAMIT-GLOBK: An advanced processing solution for static to permanent installations, allows processing of batch files and continuous data. P. H. Rydlund Jr. and B. K. Densmore. 2012. Methods of practice and guidelines for using survey-grade global navigation satellite systems (GNSS) to establish vertical datum in the United States Geological Survey: U.S. Geological Survey Techniques and Methods, book 11, chap. D1, 102 p.
UNAVCO Knowledge Base has many resources on GPS/GNSS equipment and methods. S. J. Payne, R. McCaffrey, R. W. King, and S. A. Kattenhorn. 2012. A new interpretation of deformation rates in the Snake River Plain and adjacent basin and range regions based on GPS measurements, Geophysical Journal International, Volume 189, Issue 1, p 101–22, https://doi.org/10.1111/j.1365-246X.2012.05370.x. Haeussler et al., 2000. Potential seismic hazards and tectonics of the upper Cook Inlet basin, Alaska, based on analysis of Pliocene and younger deformation, Geological Society of America Bulletin, doi.org/10.1130/0016-7606(2000)112<1414:PSHATO>2.0.CO;2.